What a surprise -- just about every Vivitar camera has a built-in flash. If you are able to provide more accurate information than is listed here, please contact us. Built-in flash. Takes four AA batteries. Built-in flash. Takes two AA batteries. 25mm (f9.5), (3/3) fixed-focus lens. Mechanical shutter with speed of 1/100. Flash speed of 1/40. No exposure control. Tripod socket. (1977) Fixed-focus 24mm (f8.0) lens. Single speed of 1/250. Accepts 100 speed film. Built-in flash good to 10 feet. Overall size 2 1/2 x 6 5/8 x 1 1/8". Uses two AA cells. 23mm (f4.0), (4/3) fixed-focus lens. Mechanical shutter with speed of 1/125. No exposure control. Tripod socket. Built in flash. 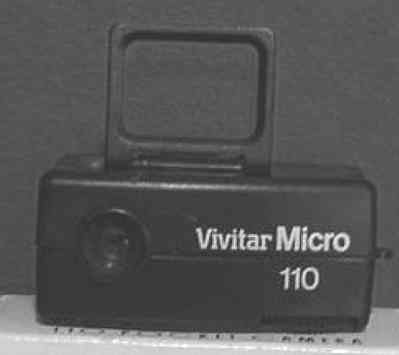 Twin (fixed-focus) lens 110 camera. The normal lens is an 24 mm f:7 - f11.0 (3 elements in 3 groups) with depth-of-field of 5 feet to infinity. The telephoto lens is an 36 mm f:7 - f11.0 (6 elements in 5 groups) depth-of-field of 5 feet to infinity. Mechanical shutter with speed of 1/125. No exposure control. Aperture is set to f7 for daylight and f11 for flash. Tripod socket. ISO 100 film only. 1 1/8 x 2 5/8 x 6 1/2". Uses two AA batteries. (1977) Fixed-focus 23mm (f4.0) lens. Mechanical shutter with speed of 1/125. Built-in flash. Dual aperture settings: f11 for normal use and f4.0 for indoors/flash. Flash ready light in viewfinder. Uses two AA batteries. Designed for ISO 100 film. (1978) Fixed-focus 24mm (f7.0 - f11.0) lens. Aperture is set to f7 for daylight and f11 for flash. Single speed of 1/250. Accepts 100 and 400 speed film. Built-in flash good to 22 feet. Uses two AA batteries. (1979) Zone-focus 24mm (f5.6 - f9.5) lens. Close-focusing to 3 feet. Single speed of 1/250. Accepts 100 and 400 speed film. Built-in flash good to 22 feet. Tripod socket. Uses two AA batteries. (1979) Fixed-focus dual lens system: 24mm (f7) and 36mm (f7) lenses. Single speed of 1/125. Accepts 100 and 400 speed film. Built-in flash good to 22 feet. Tripod socket. Uses two AA batteries. (1978) Focusing 24mm f1.9 -- f16.0 lens (five elements in four groups). Built-in rangefinder for accurate focusing -- two feet to infinity. Electronic shutter with speed of 5 seconds to 1/800. Programmed exposure provides, 1/800 at f16 to 1/30 at f1.9. Below that the shutter speed decreases. No exposure control. Accepts 100 and 400 speed film. Built-in flash good to nearly 40 feet (with ISO 400 film). Tripod socket and cable release socket. Viewfinder shows low light warning -- use flash, flash ready, and battey check. Uses two AA batteries. (1985) Fixed-focus lens, 24mm f5.6 lens focusing from five feet. Mechanical shutter with speed of 1/125. Built-in flash. Accepts 100 and 400 speed film. Uses two AA batteries. (1985) Same as 810, but with additional 48mm f5.6 telephoto lens focusing from seven feet. 1 1/4 x 2 3/8 x 6 1/4 ". Built-in flash. Uses two AA batteries. Similar to the 810. 24mm f5.6 lens. Built-in flash. Uses two AA batteries. (1980) Like the 810, but with motorized film advance. All-weather design. Built-in flash. Uses two AA batteries. All-weather design. Built-in flash. Uses two AA batteries. Built-in flash. Uses two AA batteries. (1985) Same as 815, but motorized film advance. Built-in flash. Uses two AA batteries. Fixed focus lens. Manual fim advance. No exposure automation. Built-in flash. Uses two AAA batteries. Fixed focus lens. Motorized film advance. Built in flash. Program exposure automation combines aperature and shutter speed combination. Sliding lens cover. Uses two AAA batteries. Built-in flash. Uses two AAA batteries. A keychain-type 110 similar to the Ansco 50, but more stylish.